Be careful not to allow children to swallow the battery or removed parts. 1. 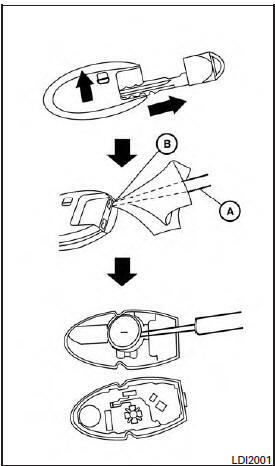 Remove the mechanical key from the Intelligent Key. 2. Insert a small screwdriver A into the slit B of the corner and twist it to separate the upper part from the lower part. Use a cloth to protect the casing. 3. Replace the battery with a new one. Recommended battery: CR2032 or equivalent. ● Do not touch the internal circuit and electric terminals as doing so could cause a malfunction. ● Hold the battery by the edges. Holding the battery across the contact points will seriously deplete the storage capacity. ● Make sure that the + side faces the bottom of the case. 4. Close the lid securely as illustrated C, D .
5. Operate the buttons to check the operation. This device complies with Part 15 of the FCC Rules. Operation is subject to the following two conditions: (1) This device may not cause harmful interference, and (2) this device must accept any interference received, including interference that may cause undesired operation. Note: Changes or modifications not expressly approved by the party responsible for compliance could void the user’s authority to operate the equipment.